Do your kids love to spot mini beasts? 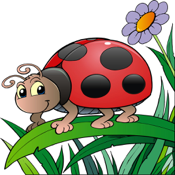 Explore and log all your insect and mini beast sightings with this fantastic easy to use tool! Start your expedition in the garden with your eager exploring team and let the mini beast hunt begin! Turn over each rock and flower pot in the hunt and begin logging your finds! Find a hiding ladybird? Then quickly record its location with the easy to use geotagging tool, then quickly take a photo with the photo button within the app to secure your sighting! You can then record notes about the sighting and record an audio note so that you don't forget precisely where you found your catch! A great fun family outdoor activity tool to use with your little eager explorers! With easy to use interface so that you or your children can easily join the hunt alone or with your help! And if you or your children use facebook or twitter-then they can instantly upload the pictures, notes or geotags of their finds directly from the app! -Great fun outdoor family activity tool! -Easy to use child friendly interface! -Record Geotags, photos, audio and written notes of all mini beast sightings! -All files held under separate file headings within the app! -Get outside with a great activity that teaches your child about nature and technology! -Easy share buttons of all sightings to Facebook and Twitter! "Really easy to use and we had a great few hours outside on our hunt- kept our 5 year old entertained for ages! We found 10 finds and Jake loves looking at the files of all our sightings!" "Really good fun! We used the minibeast spotter out in out local park! It made a real day of it for a really inexpensive day out!" "Amazing! This app went really well with out ipad and our iphone! We had a competition hunt where one team had the iPhone and one team had the iPod and we had to log as many individual sightings as possible! We won with an extra 3 beast sightings! A spider, a woodlouse and a cricket won us the day! Really simple but again the best inventions usually are! Definitely will be using this again next weekend!"